If haste makes waste, then consider Hamilton Perkins a pro at taking things slow. A certified B Corp, or benefit corporation, Hamilton Perkins makes its travel-ready "Earth" bag almost entirely from recycled plastic bottles. Manufactured in the United States, and lined with vinyl from discarded billboards, each carryall converts easily from a duffel to a backpack, complete with a three-way zippered compartment that allows quick access to sundry gear and devices. 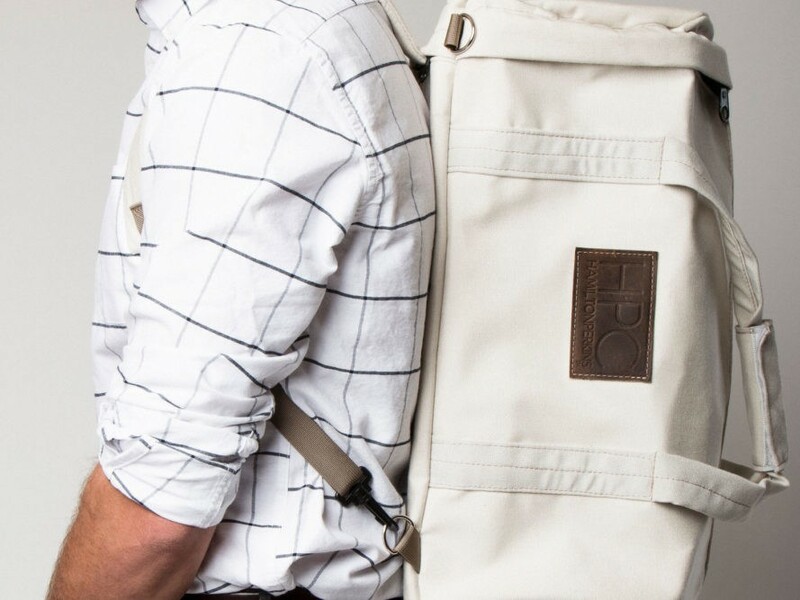 "We had trouble finding a backpack that could meet our basic needs in a practical and socially responsible way," the Norfolk, Va.–based company noted on Kickstarter, where it's looking to raise $10,000 in preorders for an initial production run. "Most bags are one-dimensional and don’t give the traveler the option to choose the version of their bag that could make their life easier when traveling." Rather than looking at philanthropy as “an afterthought,” Hamilton Perkins decided to make it an intrinsic part of its business model. The company has hooked up with Thread, a Pittsburgh, Penn.-based firm that works with nearly 3,600 bottle collectors, entrepreneurs, and manufacturing employees in developing countries such as Haiti to transform plastic waste into fabric. “In collaboration with our workshops and suppliers, we committed to supporting fair wages and delivering value to less developed nations by sourcing raw materials that divert plastic bottles, save water, add revenue, [and] create jobs in parts of the world that need it the most,” Hamilton Perkins said. The company says it’s committed to both pricing and supply-chain transparency. Most of all, the firm wants its bags, which come in colors such as navy, green, and burgundy, to not only function but function well. “We interviewed 1,000 travelers to start new authentic relationships and they told us how we could best serve their needs when reengineering a classic travel bag,” it said. The “Earth” bag costs $295, though a “lite,” albeit nonconvertible version, is available for $95. Both divert up to 16 plastic bottles from the landfill. Rather than looking at philanthropy as "an afterthought," Hamilton Perkins decided to make it an intrinsic part of its business model. "In collaboration with our workshops and suppliers, we committed to supporting fair wages and delivering value to less developed nations by sourcing raw materials that divert plastic bottles, save water, add revenue, [and] create jobs in parts of the world that need it the most," Hamilton Perkins said. The company says it's committed to both pricing and supply-chain transparency. Besides breaking down the price of producing a single bag à la Everlane, Hamilton Perkins also insists on third-party review to "ensure accuracy and accountability." "We interviewed 1,000 travelers to start new authentic relationships and they told us how we could best serve their needs when reengineering a classic travel bag," it said.